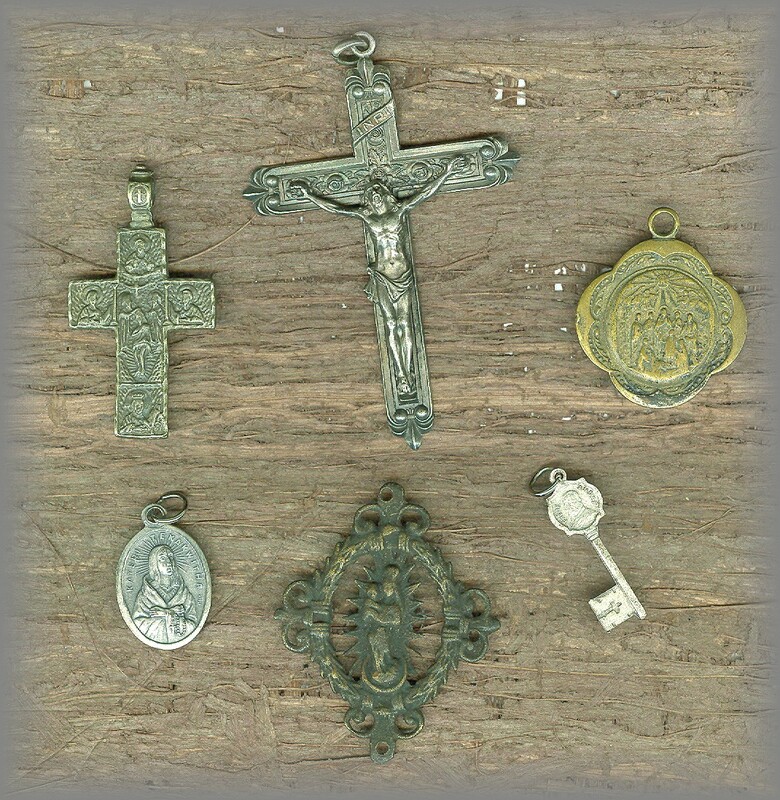 antique/vintage rosary crosses, crucifixes, religious medals, centers. antiqued to restore original patina. All beads have graduated to a page of their own. 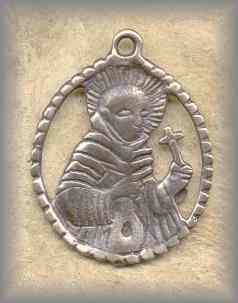 Because of your response we will be adding new selections all the time in useable counts for rosary making in 2018. 19c 20c Bavaria, Italy, Austria, Renaissance, Russia, Armenia, etc. To see full collection, more information and pricing, click image. 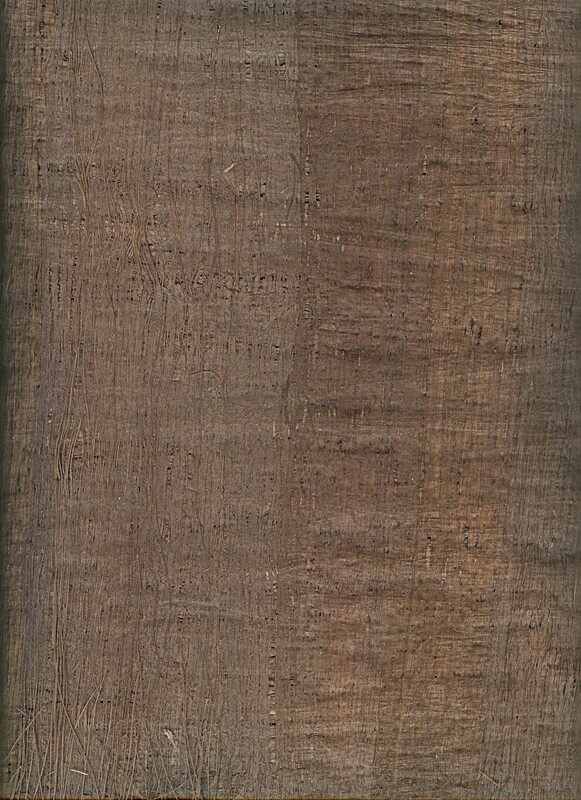 For Spanish influence on Americas, see Latin American Collection below. 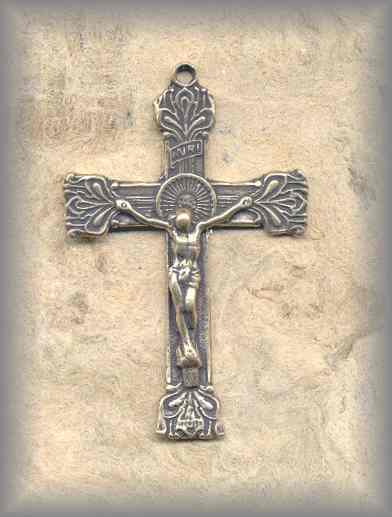 56 + more recently added European crucifixes - A beautiful collection of crucifixes to use on rosaries, chaplets, jewelry. This collection represents more recent additions. 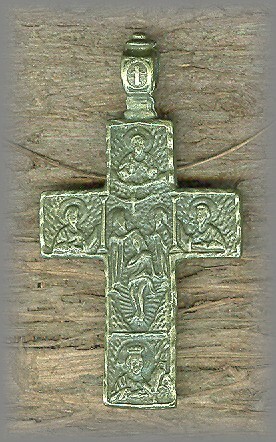 Please see Traditional Crosses (below) for more. A rare and beautiful collection of religous art dating from early 1800s back to the 7c. 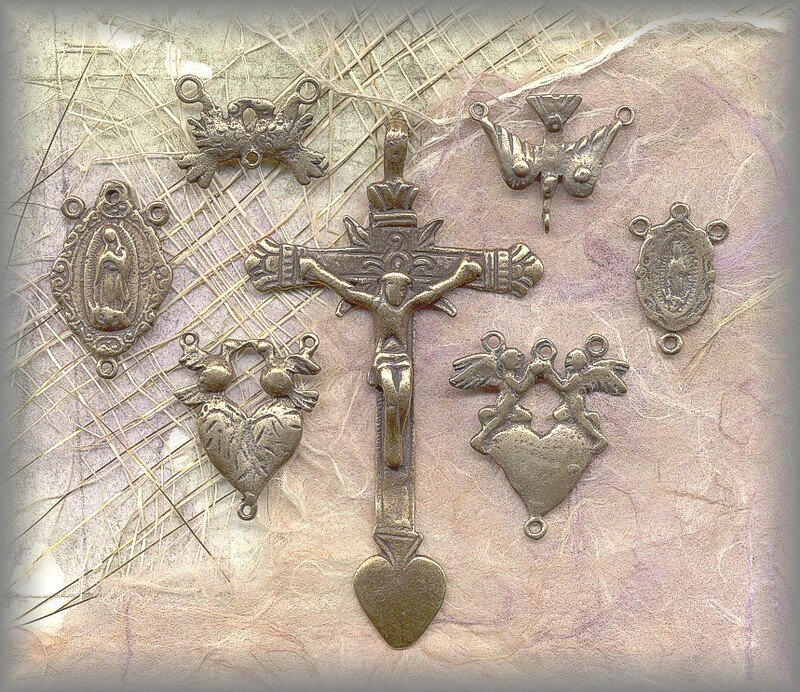 We are deeply blessed that we are able to bring these 3 collections to you, allowing them to be loved again.- 3 printable catalogs: 1. crucifixes, crosses 2. rosary centers and 3. religious medals. Be sure and see them all. 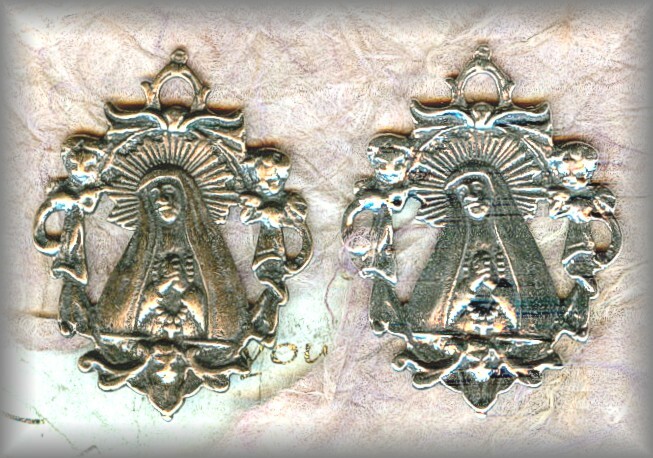 A growing collection of religious folk art pieces from Latin America. Many of these have been repaired and carefully restored before casting. Replacing missing parts brings them back to life and give us the opportunity to offer you a more beautiful and useful work of art. We are sole retail distributers on the web for most parts below unless marked. To see full collection, more information and pricing, click image. 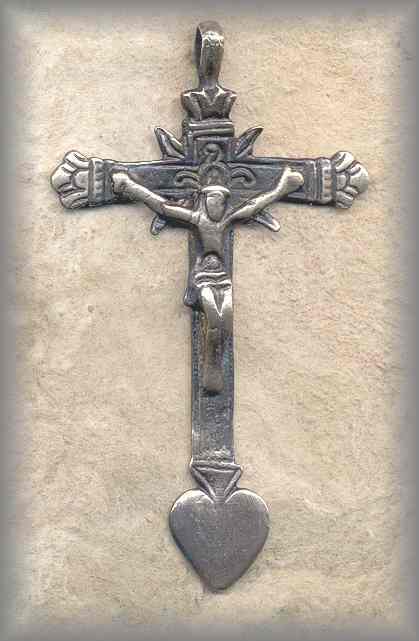 10 Latin American crosses and crucifixes - A remarkable collection of very large to small crosses and crucifixes dating from Spanish Colonial to Peruvian influence. 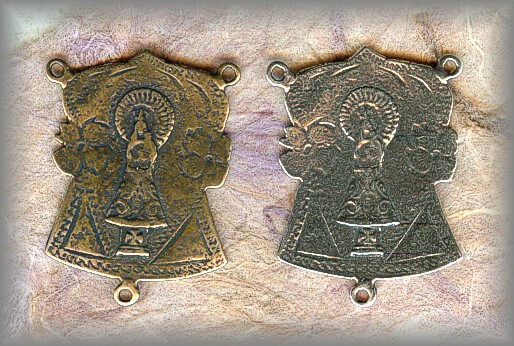 9 Latin American religious medals - Wonderful hand made medals that have a quality all their own, a mix of Spanish Colonial and indigenous folk art. 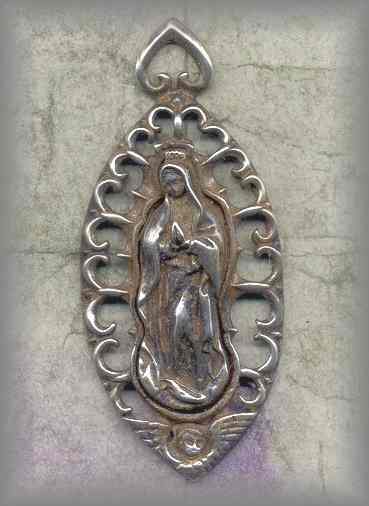 11 Latin American rosary centers - Our Lady of Guadalupe is a favorite theme in Latin America, this one is from Oaxaca. 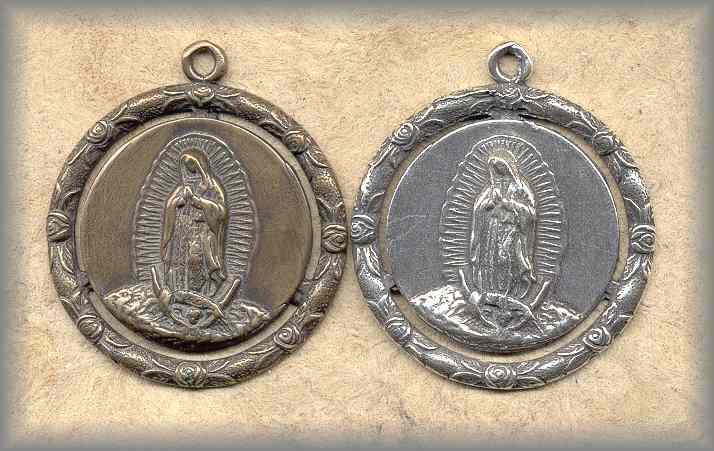 See whole collection of Lanin American rosary centers. This collection is from Ashes to Beauty. 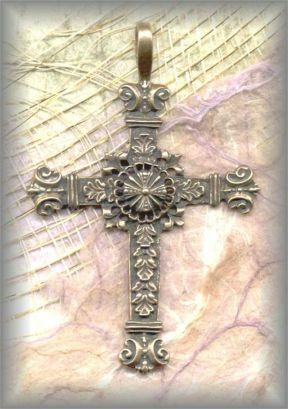 We hope to add more items soon but dont miss the wonderful crosses and religious charms or medals we have up now. To see full collection, more information and pricing, click image. 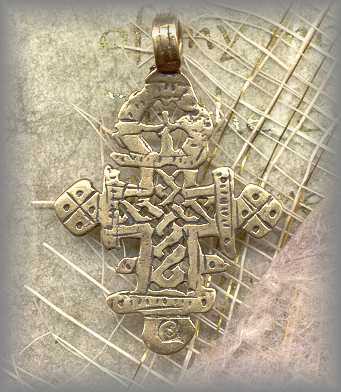 9 Ethiopian crosses and medals/pieces - A beautiful collection of Christian Ethiopian crosses from the 19th century. Sizes range from large to small. Dont miss the delightful medals from the Ashes to Beauty collection. 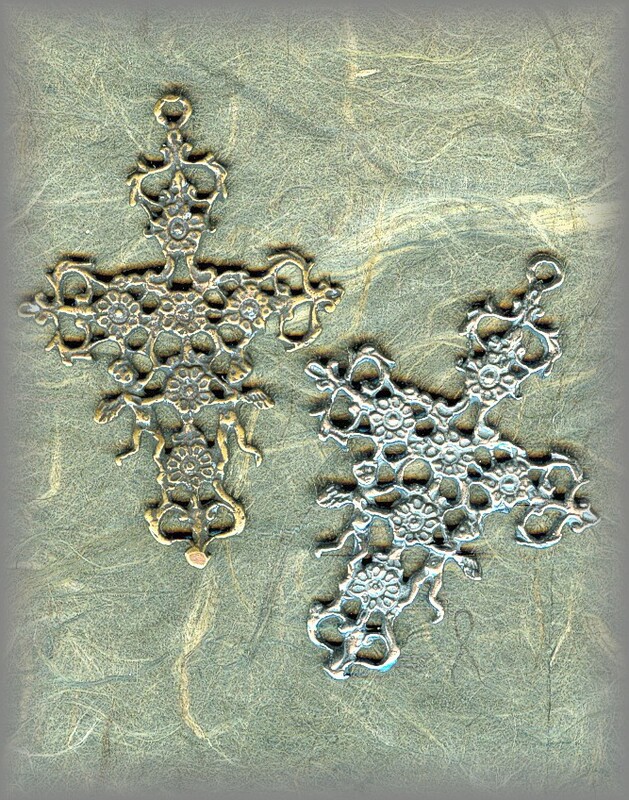 9 Ethiopian crosses and new medals/pieces - You will also find delightful medals in this series that may be used in jewelry or on prayer beads. 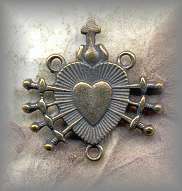 Recently added new small crosses, hearts and fish to hang from your favorite chaplet bracelet, rosary or to use in jewelry. Many of these have been repaired and carefully restored before casting. Replacing missing parts brings them back to life and give us the opportunity to offer you a more beautiful and useful work of art. 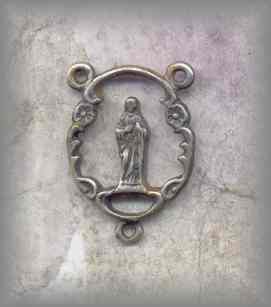 The Rosary Workshop is sole retail distributor on the web for most parts below unless otherwise marked. To see the full collection, more information and pricing, click image. 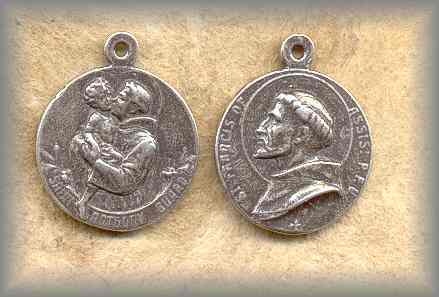 Holy Family Medals - Abeautiful collection of Miraculous Medals, St Anne, St Joseph, Two Hearts, Lourdes, Fatima. 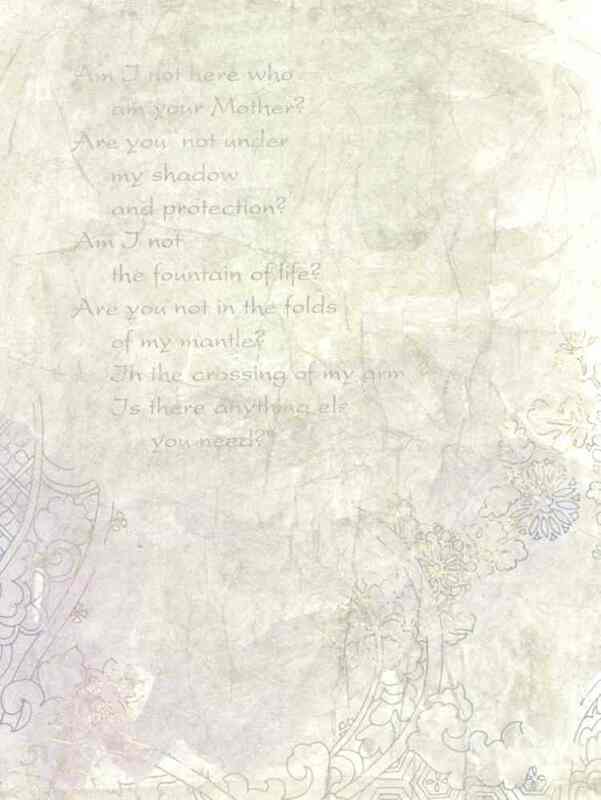 (Guadalupe: see below and Samsara). 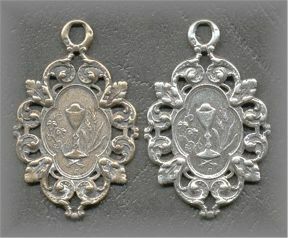 Eucharist and First Holy Communion Medals - Site is growing, we do have a nice series to show you for First Holy Commuion. 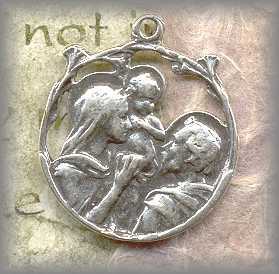 Make into a chaplet, add to a rosary or a religious medal to wear. 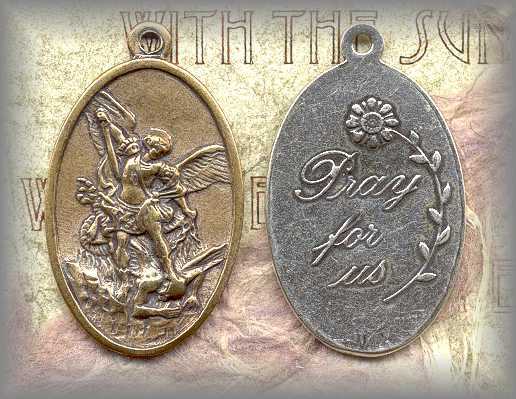 Miscellaneous Medals - Angels will reside in this link! 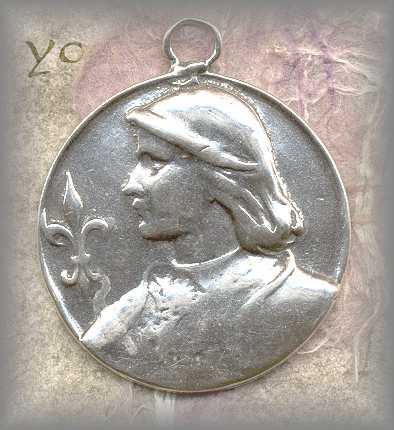 But often appear on the back of other medals so search out other links on other medals to see where they are hiding! We are sole retail distributer of Samsara's work on the web. 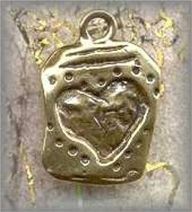 He has a wonderful eye for the vintage and antique pieces and collects the finest to cast in solid bronze and sterling silver. 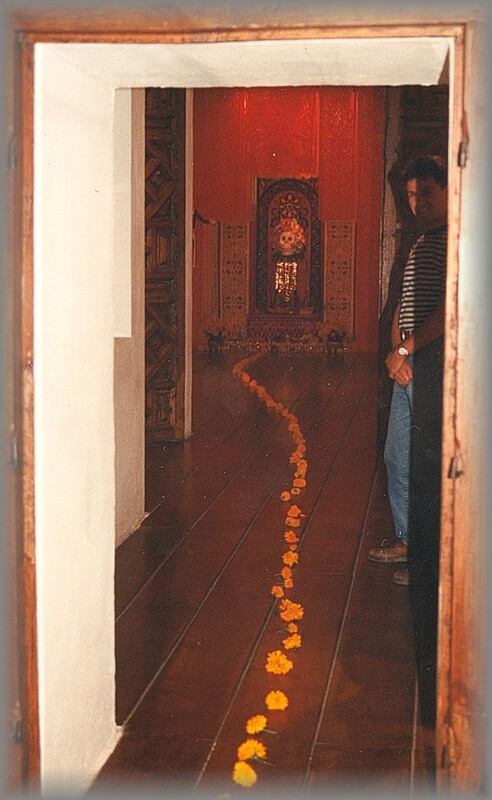 Much of his collection is from Latin America so be sure to see it all. 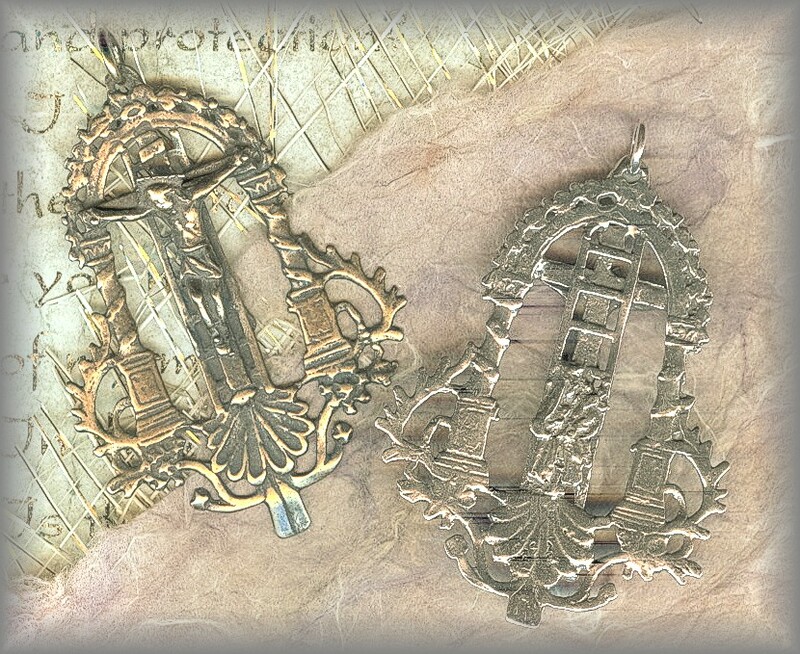 Some of our new Samsara Collection may be in Antiqued Brass instead of Bronze. 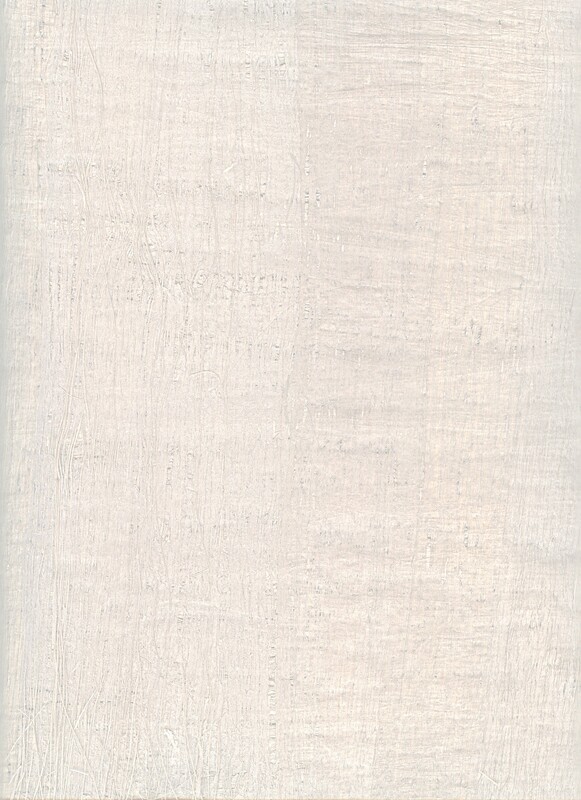 The purpose of this is to give you a better color in the finished product. He assures us: 'but without any nickel, antimony or lead. Please note we may not be able to reorder in the future. over 5 crosses - from very small to large pectoral crosses. 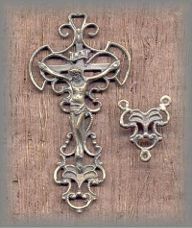 Some of your all time favorites are here, a magnificent selection of crucifixes. More coming. 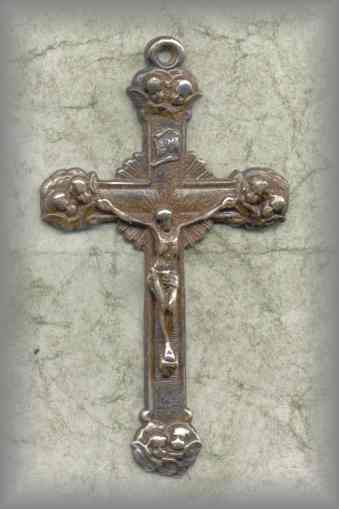 over 16 crosses - from very small to large pectoral crosses. 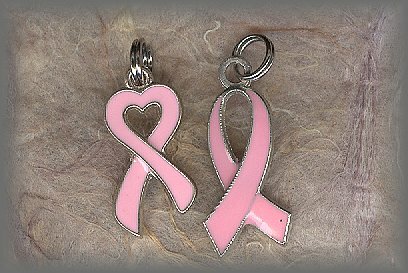 Wear the smaller ones on a bracelet, the larger ones around your neck or use on rosaries and chaplets. over 7 centers - Pio, Guadalupe, nativity (infant), Fatima, Sacred Heart with more coming. Keep an eye open for new items in all categories. over 26 medals - many of Our Lady of Guadalupe, Sacred Heart of Jesus, of saints such as Jude, St Michael, Dominic, Lourdes, Miraculous Medal, Infant of Prague. Also many unexpected and interesting wearable sacramentals included. We looked everywhere for bronze findings for our rosaries, chaplets and jewelry. So these were a wonderful find. 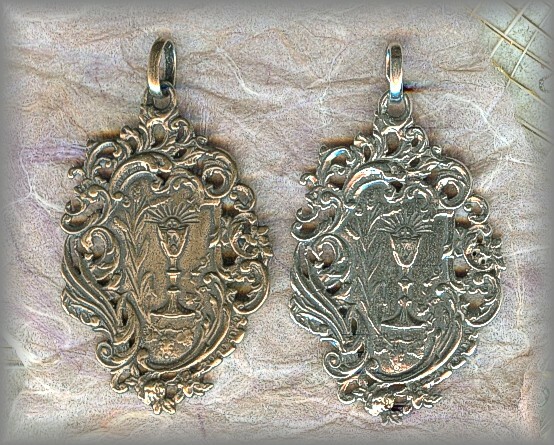 Each metal piece is hand made then cast from antique and sterling pieces in not only bronze but sterling. More will be added as we grow! 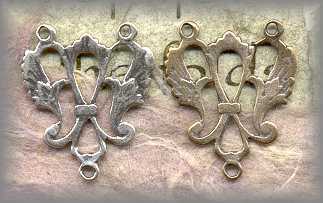 4 jewelry clasps - Four beautiful hand cast jewelry clasps for necklaces - we use them on our pieces, available in bronze and sterling. Be sure and see all designs offered. 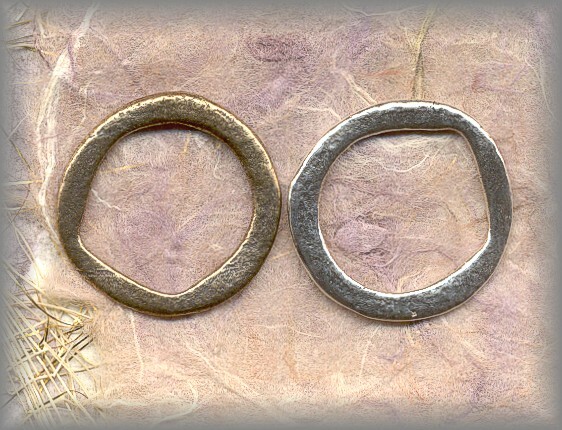 antiqued bone rings - no longer avalable - we used the bone rings on our earlier Penal Chaplets as unable to find the old traditional Celtic money rings you now see below. Now happy to use the correct traditional metal rings on t he 10 bead chaplets. Purpose of the ring: The ring would fit over and be transferred to eachof the 5 fingers to complete praying a full 5 decade rosary. 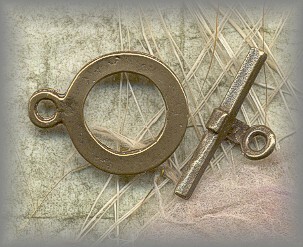 2 different metal rings, flat one see left image) is rough textured, flat and uneven. 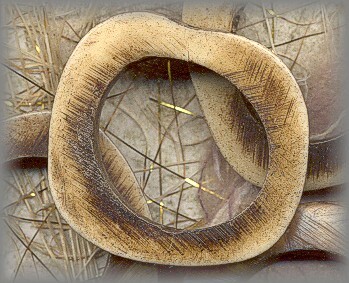 Other is smoother, see both - They are cast from ancient Celtic Money Rings. 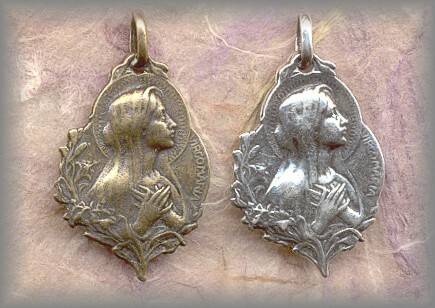 Available in bronze and sterling. One of the questions that comes up all too often is, 'which center should I use with this cross? 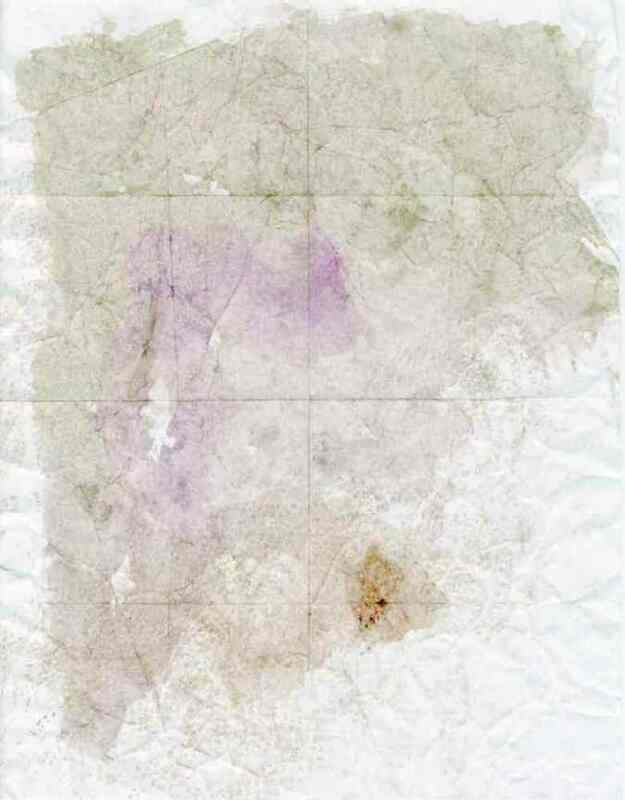 Here we have combined a cross with several centers so you can see how they look according to size and textures. These are just a few suggestions to get you started and on your way. Don't miss any of our new items, we have searched out the best for the money. And these are the items we use when making the rosaries on our site. 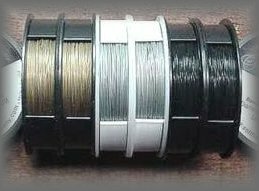 All the tools you need to make strung rosaries - .019 Softflex wire in 3 colors, crimps to match, 2 pair side cutters and crimping pliers. (no supplies for chain making yet). 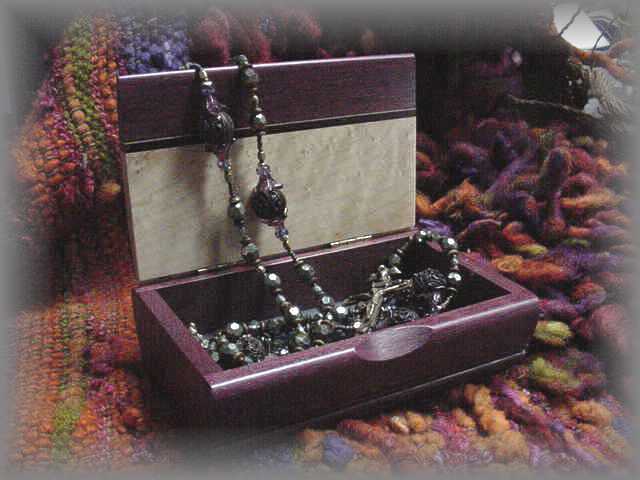 Beautiful hand made boxes and pouches - store your rosaries and jewelry in a beautiful way. Great way to package your special gift as boxes may be engraved for presentation and to remember a special time in one's life. "Let us show gratitude by which we may offer to God an acceptable service with reverence and awe - for our God is a consuming fire"
We love giving these old treasures new life! We have gone to a lot of trouble, time and effort searching, purchasing, researching dates and history. We restore damaged pieces to their original beauty before they are cast and made available. All this so we all can use them again. There is nothing that pleases us more than to hear from you. It means so much to us knowing you are enjoying using these beautiful pieces in your work as much as we do. 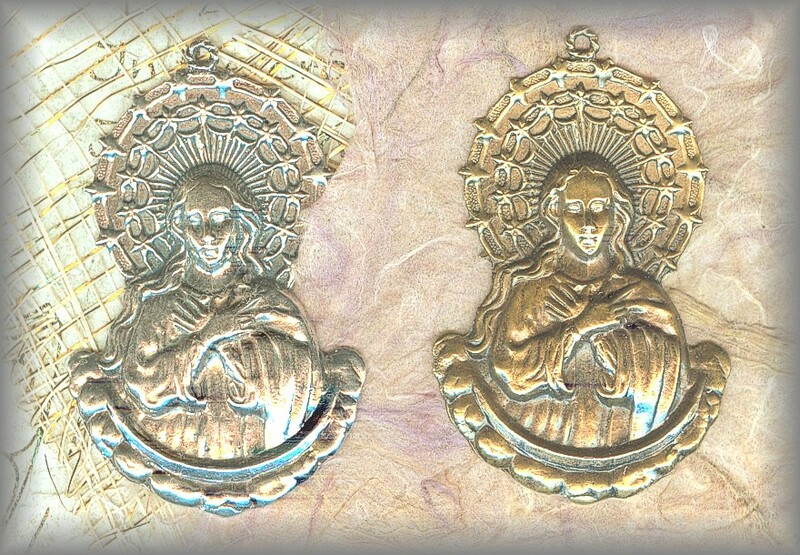 We too are inspired by them and humbled by the richness of these rare old designs when incorperated into rosaries. 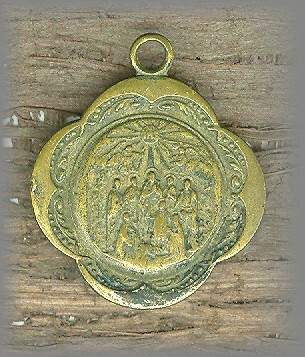 THE ROSARY WORKSHOP RECOGNIZES MANY OLD TREASURES ARE STILL AVAILABLE IN FLEA MARKETS, EBAY, ETC. (SOME ARE THE SAME AS THE ONES WE ARE USING, SIMPLY BECAUSE THEY WERE ORIGINALLY CAST IN LARGE NIMBERS) WE ENCOURAGE OTHERS WHO WISH TO REPRODUCE THEM TO PURCHASE THEIR OWN, REPAIR, RESEARCH AND CAST AS NEEDED. PLEASE NOTE: We honor the fact that Equatoria AND Samsara have also restored, modified, merged and upgraded many of these old and antique pieces offered on our wholesale and retail sites. (To make them more useful for all of us.) In many cases this brings them into a new catagory and out of public domain. Some now carry copyrights and we recognize and honor them as such. We have never nor will we ever remove any copyrights, trademarks or signatures on items before casting them. We recognize that others before us may have done this and that a piece may have been recast several times before reaching us, which is out of our control. 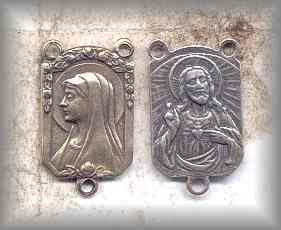 All crucifixes, crosses, rosary centers and medals found and restored by the Rosary Workshop to be hand cast are, to the best of our research and knowledge, from Public Domain - This means they are either too old to trace or have no visible signs of a copyright or trademark on their surface. We note that if a piece contains the signature of an untraceable artist (recognized to be over 70 (Europe) to 100 years old) we will share this information in respect to their work. + If at a later date we discover an item does hold a legal copyright or trademark we will either credit the designer in respect of the artist or remove the item from our stock. Please be aware that because of rising shipping costs, it is very expensive to ship small orders under $25. Because of this you may have noted most suppliers require a $50 to $100 minimum order to help defray cost of items per unit. Orders over $100 receive a 10% discount, over $300 no shipping/handling charge (within US) + 10% discount! Over $500, 15% and over $1000 - 20% discount Unfortunately we do not have wholesale discounts on parts as we do not cast in bulk. 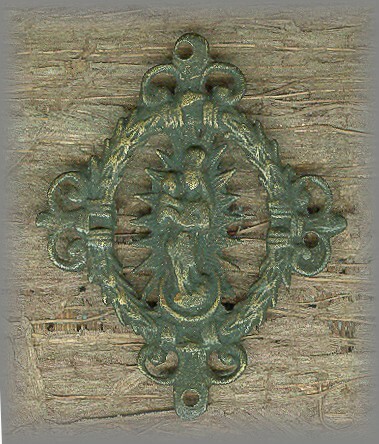 Each reproduction of an antique piece is individually hand cast, cleaned, buffed and antiqued to insure quality. 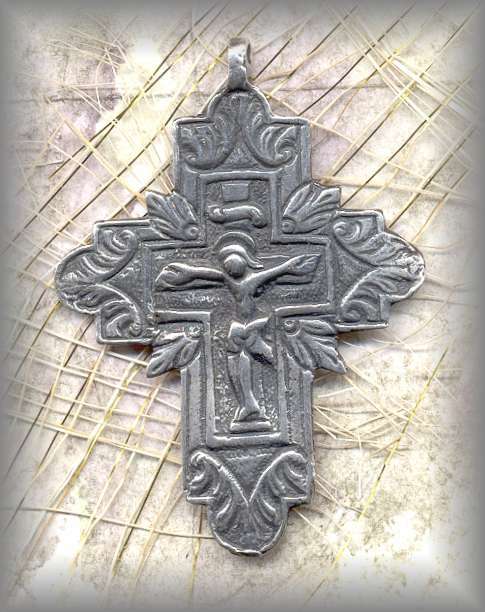 Each crucifix, cross, rosary center and religious medal in our collection is a rare and precious reminder of our faith regardless of the metal used. 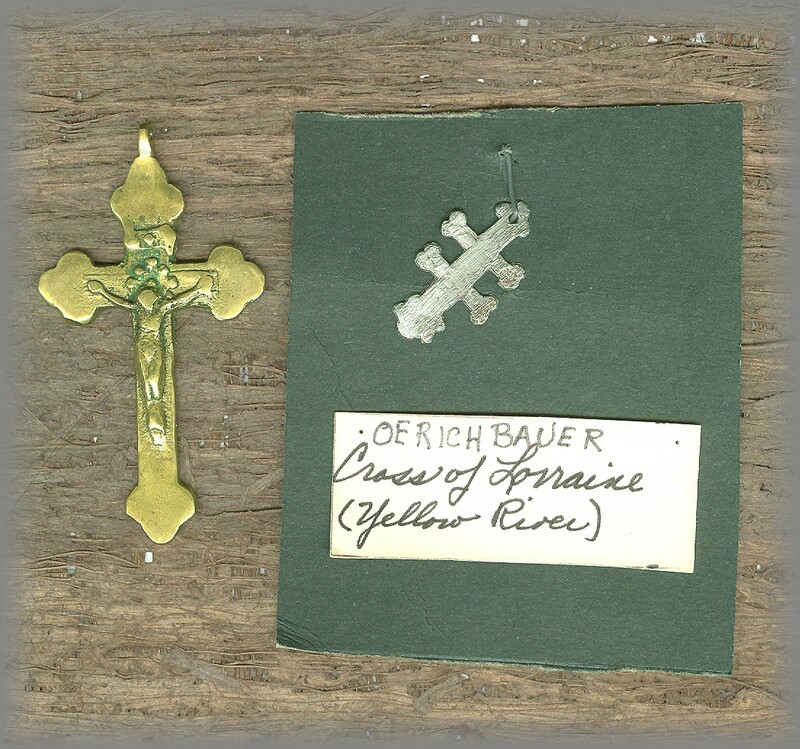 We take great joy in finding these old (3rd - 20c) unmarked crosses, crucifixes and medals which are un-repeatable today. Many show wear from love and use. Once cast, each piece is individually hand cleaned, antiqued and polished to restore its original patina. THE GOLD (SILVER) RUSH IS ON! To keep parts cataolg current, all pricing will be available in the cart and may be seen by clicking images, as all pricing has now been removed on the online PC catalogs. If you are printing off individual catalogs, always keep an eye on the monthly updates in the upper left hand corner regarding new items and discontinued items. Again, restoring and handcasting these old pieces not only brings them out of obscurity - giving them new life - but also helps us reflect on our heritage as a continuing people of God. If in any way these beautiful sacramentals - that have been given new life - have encouraged or strengthened your faith or created a stronger devotion to our Lord, they have accomplished their purpose and we are truly filled with gratitude for having the opportunity of making them available again. The first Hail Mary was brought to earth by Angel Gabriel to Mary. 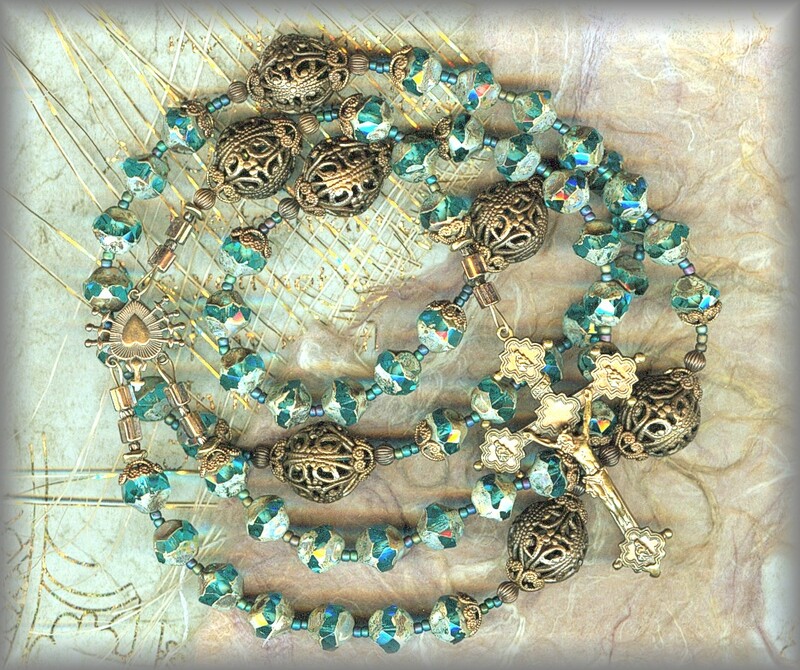 Paul VI called the rosary "a compendium of the Gospel." Pio called the rosary, "his weapon". At Fatima, Mary identified herself as, "I am the Lady of the Rosary"
"I have come to warn the faithful to amend their lives and to ask pardon for their sins. They must not offend our Lord any more, for he is already to grievously offended by the sins of men. People must say the rosary. Let them continue saying it every day." For your convenience, all parts are now in a smaller catalog format for printing. (page print off total at bottom of each page). Great for rosarymakers who do not have access to the internet. (include order sheet (link on bottom of each page) for mail in orders. Watch updates in upper left hand corner to keep catalog current re: availability, pricing and new items. 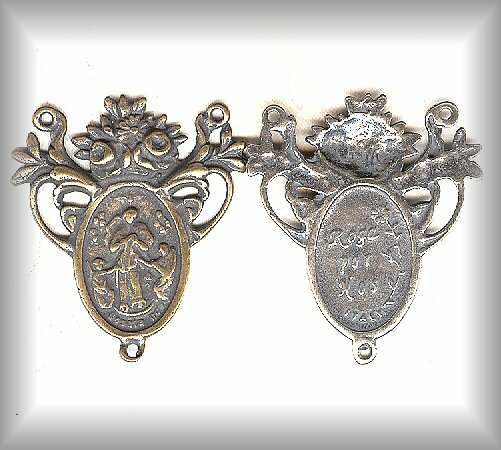 European rosary crucifixes - more recent additions. missing something? check thes link as may be in here! MORE TO SEE FROM LAST YEAR! 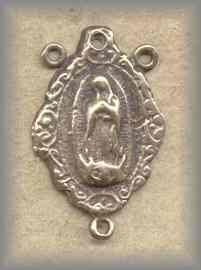 mission rosary maker? Need an address for cord supplies? 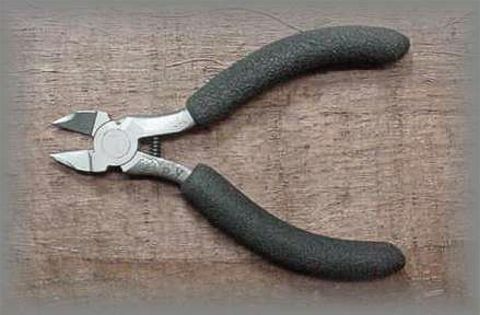 how to secure *soft-flex* wire using crimping beads and crimping pliers. Comments below are from customers and reflect the overall comments we receive daily. It gives us such great pleasure to know that our ministry is making a difference, even in the midst of rising prices of silver and bronze. The vintage/antique items we cast give them new life and we believe are more beautiful than most of the parts available today. We are told daily, the parts we have cast do make a powerful difference in the overall rosary and chaplet design. I just received my order of rosary parts. They bring tears to my eyes they are so lovely. "S?P's downgrade of U.S. debt sent investors fleeing from stocks and turning instead to gold and silver." This has caused these commodities to skyrocket even more to new heights. Silver and Gold simply offer a safer market for investors over the last few years. These prices were going up and affecting our prices years before the recent S?P credit downgrade. There are no signs this will stop any time soon as the market continues to fluctuate. This causes the gram wt / per ounce to soar. And like you we are in shock as the new prices on our silver parts are coming in - often more than doubling over night! GRAM WT OF METAL AT TIME OF CASTING. 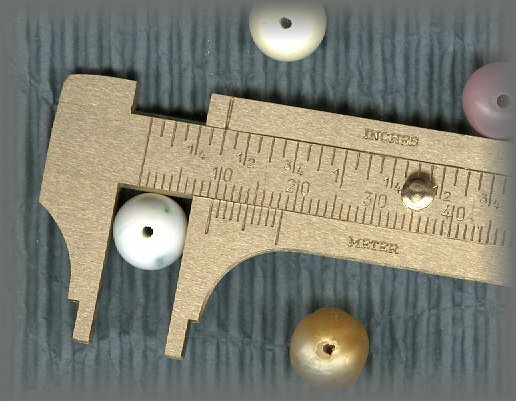 When our caster purchases the raw silver, they pay the current market price by weight. They pass this price on to us and, sad to say, we in turn must pass it on to our customers. Yes,and the good news is that the market value is also passed on to each of us. What continues to amaze us is that our sterling silver vintage and antique pieces are selling better now than ever (even over solid bronze). In the meantime we can only pray that as the market settles down, so will silver! Please note, we do not change our prices until we have to pay them and honor the prices that show in the cart. 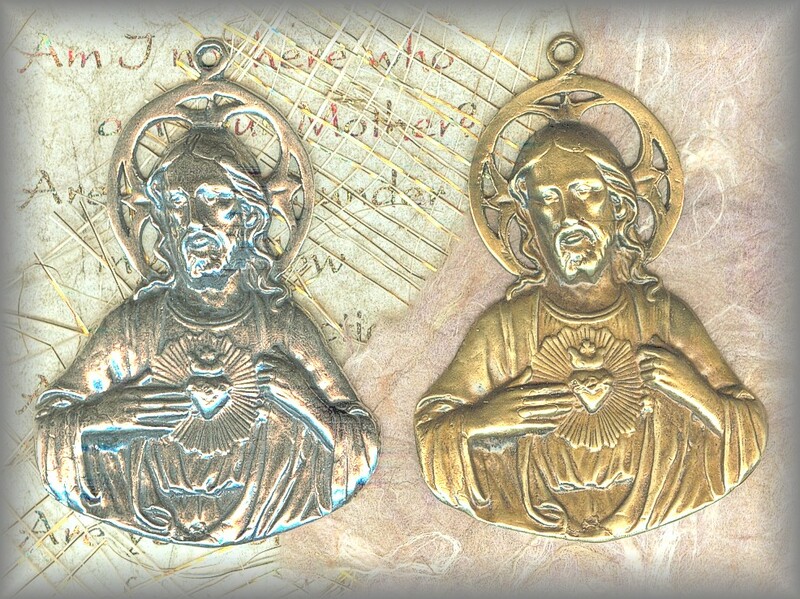 We will continue to offer our crucifixes, centers and religious medals in silver and let you decide. 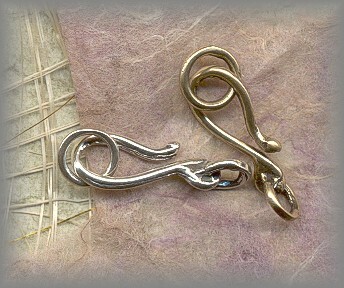 PLEASE NOTE WE ARE BEGINNING TO RANDOMLY ADD WHITE BRONZE TO OUR COLLECTION WHICH IS LESS EXPENSIVE. BACK ROW: Marian and Hal.